Jennifer M. Croswell, M.D., M.P.H. Martha L. Daviglus, M.D., Ph.D., M.P.H. What Factors Are Associated With the Reduction of Risk of Alzheimer's Disease? 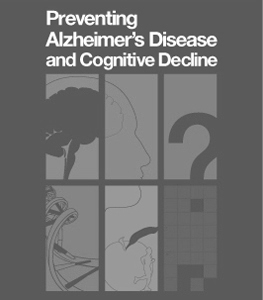 What Factors Are Associated With the Reduction of Risk of Cognitive Decline in Older Adults? John W. Williams, Jr., M.D., M.H.S. What Are the Therapeutic and Adverse Effects of Interventions to Delay the Onset of Alzheimer's Disease? Are There Differences in Outcomes Among Identifiable Subgroups? What Are the Therapeutic and Adverse Effects of Interventions to Improve or Maintain Cognitive Ability or Function? Are There Differences in Outcomes Among Identifiable Subgroups? What Are the Relationships Between the Factors That Affect Alzheimer's Disease and the Factors That Affect Cognitive Decline? Hugh Hendrie, D.Sc., M.B., Ch.B.